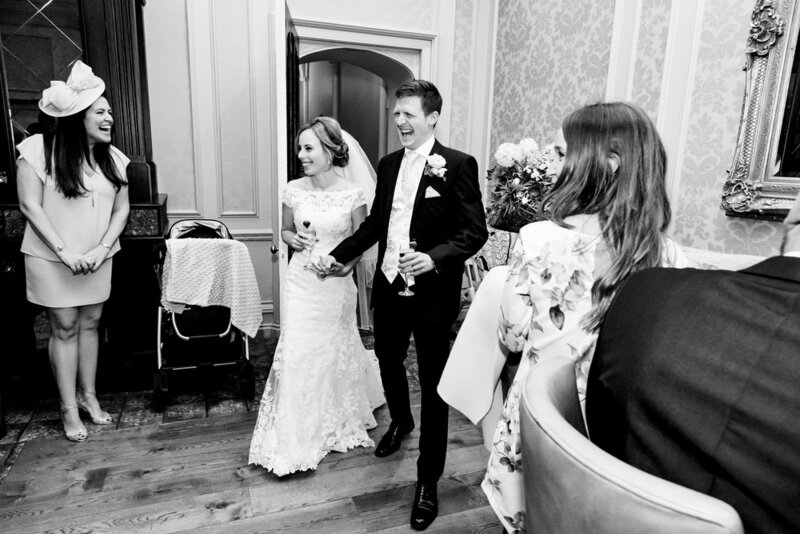 Olivia and James got married at the fantastic De Vere Latimer House in September, and despite persistent rain the couple had the most amazing day with their families and friends. The bride and bridesmaids got themselves ready in an amazing room at Latimer House which had wonderful views overlooking the Latimer Estate grounds. Once ready the bridal party drove a short distance to the church at St Mary’s in Chesham for the wedding ceremony. Following an emotional ceremony the wedding party made the short trip back to Latimer House to carry on celebrating. Guests enjoyed drinks and canapes with the couple in the bar adjoining the main wedding reception room. Following this, due to the inclement weather we had to get creative with the family groups and bridal portraits, which took place indoors. Luckily Latimer House has plenty of grand hallways, staircases and cosy little areas which certainly helped in this. Sometimes you can’t always have the sun but we managed to get some awesome shots for Olivia and James. The wedding breakfast and speeches followed, then the evening party got into full swing. James was more than happy to show off his full repertoire of dance moves and that really got things going! I had an awesome time at this Latimer Estate wedding, and if you are planning on getting married and are looking for a Latimer House wedding photographer get in touch! Here are some of the lovely photos from the day.